Did American education go completely to hell in the 70s and 80s? It sure doesn’t look like it. Both reading and math scores stayed almost rock steady during the entire “Nation at Risk” period. 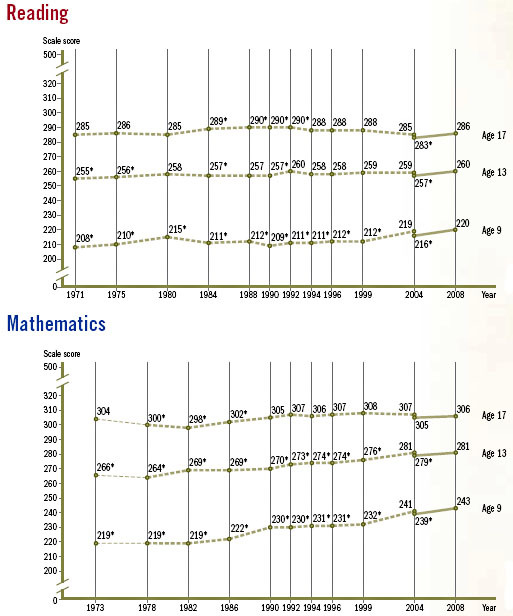 Did things improve with the passage of NCLB and the advent of massive high-stakes testing? Scores for 9-year-olds have gone up a bit, but past evidence suggests that gains among young children usually wash out by the time they’re 17. There might be a bit of progress over the past eight years, but the evidence is very thin and very tentative. Overall, among 17-year-olds, the average reading score during the past four decades has gone from 285 to 286 and the average math score has gone from 304 to 306. There’s hardly cause for either alarm or excitement. Obviously there are lots of details when you look at this stuff. NCLB mostly focuses on lower grades, and most of those kids haven’t yet gone on to high school. So maybe it just needs more time. There are racial and gender gaps to look at, differences between public and private schools, and the effects of concentrated poverty. Still, I think it’s useful sometimes to take a look at the bottom line: plain old average scores over the past four decades among 17-year-olds. And despite all the changes during that period in demography, testing, pedagogy, and popular culture, there just hasn’t been much change. I’ll leave it as an exercise for the reader whether that’s good news or bad.